At Breaking the Silence we aim to expose the public to the daily reality of the occupation and Israeli military rule over the Palestinian civilian population in the territories, a reality we witnessed firsthand during our military service. By publishing soldiers’ testimonies on their service in the occupied territories, we aim to generate opposition to the occupation through meaningful public debate on the significant moral price paid by Israeli society for entrenching the ongoing regime of occupation. We believe that, as a society, we must take responsibility for actions carried out on our behalf in the occupied territories. Taking responsibility includes, first and foremost, the right and duty to be informed of the reality of the occupation and to understand the true meaning of the mission that Israeli soldiers have been sent by Israeli society to carry out over the past five decades. As soldiers who served in the territories, and implemented the policies of occupation, we believe that our testimonies (gathered from over 1,000 soldiers who spoke about their experiences in the territories) allow us to show the public an intimate and authentic picture of the daily routines of the occupation, and the meaning of life under military rule. But what do you propose? What is your solution to the conflict? We believe that in order to formulate a solution to a certain problem, one must first understand and acknowledge the problem itself. We believe that any solution of the conflict must be based on facts on the ground. As an organization of soldiers who broke the silence to present the public with the reality of the occupation, our advantage over other organizations, is not our ability to offer a solution, but rather to avail this firsthand information to the public. Many solutions have been presented to resolve the conflict, or put an end to the occupation. We support any solution that can usher in liberty, equality, prosperity, and self-determination for all sides. With that noted, to reach a solution one must aspire toward it; this requires acknowledgement of the reality of occupation and its cost, which is where we come in. Our over 1,000 testifiers support a range of different solutions, and we will not propose a solution that doesn’t reflect all members of Breaking the Silence. That noted, we all agree that the occupation cannot be a, solution and must be ended, as military rule over a civilian population can never be moral or humane . But what can we do, there’s no choice when it comes to national security. We attempt to question our moral boundaries as a society, and to ensure that we aren’t crossing red lines in the name of security. For instance, practices such as collective punishment or using innocent bystanders for practice drills (‘mock arrests’), are carried out regularly in the name of security; one of the basic principles of the IDF’s operational policies in recent years is ‘to create a sense of persecution’ among Palestinians, intended to enable enforcement and control. Moreover, over the past 50 years we have witnessed that the occupation isn’t necessarily effective in an effort to achieve security. We believe that one of the best means for Israel to achieve security is to secure the well being of Palestinians, putting an end to the cycle of violence. We believe that claiming that ‘there’s no other choice’ is merely shirking responsibility, and recycling empty clichés. There are many options and we must choose one, but if as a society we choose this specific option – to continue the occupation – we must be well aware of the price, and stop deluding ourselves that there is no other choice. Why does the right-wing claim that you lie? We don’t. Over the course of over a decade of programming we have gathered and published thousands of testimonies from over 1,000 soldiers and officers. Not one of our testimonies has ever been proven false, to date. The rigorous verification process that each and every one of our testimonies undergoes prior to publication has proved itself reliable time and time again. The research team in charge of collecting and verifying testimonies is composed of veteran soldiers who have undergone a long and professional training process. One poignant example of the professionalism of the verification process was the unmasking of a false testimony provided by Likud MK Oren Hazan’s testimony, who tried to deceive us by offering a testimony on his alleged participation in Operation Protective Edge. In fact, MK Hazan never served as a combatant, neither in this operation nor in any other. Similar efforts to deceive us with false testimonies have occurred over the years, all of which were easily identified, discarded and never released. In recent years the Israeli public was exposed to several reports that allegedly “exposed lies” concerning Breaking the Silence and its activities. Time and time again these accusations were proved completely false and groundless, aimed solely at intimidating and silencing organizations and individuals opposed to the occupation, in an attempt to smear the names of soldiers who chose to break the silence through testifying to Breaking the Silence. In the face of right-wing and settler groups’ deceptive populist claims, thousands of verified soldiers’ and officers’ testimonies tell the true story of military rule over a civilian population, as experienced during our service in the West Bank and the Gaza Strip. We are aware that these testimonies place a mirror before the Israeli public, reflecting a painful, bleak reality. Yet, to our regret, this is the reality that we experienced during our military service in the occupied territories, and this is the harsh reality about which we insist to speak. We believe that the Israeli public must listen to the soldiers sent by the State of Israel to enforce the occupation. Denial through refusing to see and hear the reality described in soldiers’ testimonies, entails evasion of responsibility and duty toward soldiers sent to carry out this mission. Why don’t you work with the army to try and improve the system? We believe that the mission of occupation carried out by the IDF for just over five decades, is inherently immoral. As such, any attempt to fulfill this mission necessarily compels the IDF to carry out immoral actions. As we see it, military rule enforced over another nation necessarily violates basic rights of the civilian population and is impossible without the use of constant violence. That is why our goal at Breaking the Silence is to end the occupation, not to improve it or make it more humane. Israeli society and successive Israeli governments entrusted the IDF with the mission of enforcing the military occupation over Palestinians since June of 1967. Thus, the decision to end the occupation must also be taken by Israeli society. Therefore, the demand to end the occupation and the moral debate we hope to spark to this end, is aimed at the general Israeli public, and not necessarily at army commanders and soldiers. We would like nothing more than to witness a decrease in the suffering the occupation has caused millions of Palestinians, but we know that such improvements will not solve the problem. We believe that only a complete end to the occupation will bring about true fundamental changes in the lives of both nations, ushering in a better, more just, future for all. The thousands of testimonies we have collected prove that all sorts of soldiers – whether more or less moral – cannot change the mission itself. In this sense, if all you have is a hammer, then everything looks like a nail. Why are you so controversial? The testimonies we publish hold a mirror before the face of Israeli society, and portray a very unpleasant image. Therefore it isn’t surprising that some public responses are extreme – ranging from ignoring testimonies, to complete denial, to violent intimidation and persecution. In parallel, much of the public understands the importance of the publication of these testimonies. Each year, ever more soldiers reach out to us in order to break their silence, and ever more groups and communities contact us to hear about the reality we experienced as soldiers in the occupied territories. Do you support military refusal? As a movement that brings together many testifiers who have different views on conscientious and political objection, we do not believe that we can or should determine one view that is representative of all testifiers. There are many ways to challenge the occupation. We believe that every person should choose their individual path in resisting the occupation. Any such decision is one’s personal choice, and as an organization we have no intention or will to impose any binding form of action. What Is the Process for Verifying Testimonies? Our experienced research team is comprised of veteran soldiers who have undergone a 12-month professional training process. All testimonies undergo a two-stage verification process before being approved for publication. The testifiers are our ‘sources.’ We verify the credibility of the testifier before any testimony is published, and when there is any doubt as to his or her credibility, the testimony remains unpublished. In the past we were approached by ‘imposter’ testifiers who tried to trip us up by providing false testimonies on their service and military activity. Fortunately, our meticulous verification process helped us identify these imposters. We cross-check the information provided in the testimonies regarding each specific incident with other sources. We publish testimonies only after the relevant information has been cross-checked and verified. As any self-respecting journalist or researcher knows, asking questions and receiving answers is the basis for the ability to cross-check information, verify details, establish credibility, and ensure that the testifier is accurately telling their story. The sources we use to verify the details of the testimonies include soldiers and agents who were in the area, such as police officers, journalists, Palestinian residents, and others. In addition, we also cross-check relevant information reported by Israeli, Palestinian, and international organizations operating in the territories. Sometimes certain data is cross-checked with military or police publications, as well as information published in the media or by the IDF spokesperson. Why are the testifiers anonymous? The testifiers are not anonymous. Testimonies are given in face to face interviews, and testifiers’ identities are known and verified by the interviewers. Dozens of Breaking the Silence’s testifiers have testified publicly, and their video testimonies can be found on the organization’s website. All of our testimonies are reviewed and approved by the Israeli Military Censor prior to publication. We are obligated, first and foremost, to all the soldiers who have joined us in breaking the silence. One must remember that exposing oneself as a Breaking the Silence testifier, comes at a high social cost in Israel, indicated through harsh threats and feedback faced by many individuals associated with Breaking the Silence. To protect and defend our testifiers from this wild unbridled incitement, their personal details are not made public for as long as they wish to remain unexposed. Breaking the Silence addresses the broad picture of the policy of occupation, which is inherently immoral – and not the specific conduct of any individual soldier. Therefore, the primary importance of testimonies doesn’t lie in the personal details on specific soldiers, but is rather found inthe similar reality described in the testimonies whether the soldier served in Nablus, Hebron, or any other town or village in the occupied territories – regardless of their unit. Diverting the debate to the question of testifiers’ anonymity, is yet another attempt by those seeking to maintain Israel’s military rule over the territories, to shift attention from the most important issue namely the occupation and its moral price. How many testimonies have you published? Why are there less recent testimonies and more older ones? Over 1,000 soldiers have chosen to break their silence and testify since 2004. The soldiers who broke their silence chose to take responsibility for their actions, sharing with the public what they did during their service in the West Bank and Gaza, whether during routine periods or during combat operations, – to encourage public discourse on the moral price of over five decades of militarily controlling another nation. For most testifiers, breaking the silence is a complex process that includes an element of assuming responsibility for the actions they (we) carried out, and recognition of the reality in which we partook. We know, firsthand, that sometimes a period of time is needed in order to process and be able to discuss such matters openly, while coping with their deeper meaning. That is the primary reason why most soldiers who choose to break their silence only reach that decision several years after their army service. The testimonies we gather are only published following the completion of their production process. This process includes several stages: confirming the credibility of the testifier, verifying the testimonies themselves, removing details from the testimony that could identify the testifier, passing it on to the military censor for approval, and having it cleared by legal advisors. Only following all these stages is a testimony published. This process usually takes anywhere from several months to one year. Each year we interview about 100 soldiers who served in various areas during different periods. Sometimes we make an investigative effort to interview soldiers whose service had specific characteristics, relevant to a current moral debate on certain practices. For example, throughout 2014, the majority of our efforts were invested in gathering testimonies from combatants who partook in Operation Protective Edge, which resulted in the subsequent publication of our book ‘This iIs How We Fought in Gaza, 2014. In contrast, a year earlier, we focused on soldiers who served in different areas of the West Bank. How is it possible that different soldiers have different versions of what really happened? If we were to take 10 soldiers who were present at a specific incident (certainly during combat) and ask them what happened, we would hear 10 slightly different accounts. How can one tell the truth? One verifies the facts, allowing room for the analysis, feelings, and thoughts of the soldier who provided the testimony. It is important to remember that at Breaking the Silence we publish soldiers’ testimonies on missions they carried out during their military service. Obviously, these testimonies are told from each soldier’s unique perspective, both ethical and physical. Naturally, we verify the factual details described by the testifiers, but anyone who has read our testimonies is aware that they also express the testifiers’ impressions and feelings – which need not, and cannot, be verified. At times, we publish several testimonies concerning the same incident – with each of the testimonies shedding additional light on various aspects. We are pleased whenever our testimonies lead to additional examinations and inquiries – whether by journalists or other entities – that may help illuminate events. Regretfully, we are also aware that if every incident relayed in our testimonies were to be investigated, a harsh reality would be exposed. Military Police investigators told the HaMakor TV show that dozens of investigation, initially opened as a result of testimonies published by Breaking the Silence, were closed solely due to the possible harm that revealing the truth could cause the State. The Military Police simply did not wish to open the Pandora’s Box of reality in the occupied territories. You only show one side of the story. We show the reality of the occupation as it is reflected in the testimonies of over 1,000 soldiers who served in the occupied territories from 2000 on, to date. The testimonies shift the spotlight onto a crucial issue that is seldom discussed openly, and is often silenced. We believe that for the general public to be able to form serious, informed positions on Israeli rule over the civilian Palestinian population, it must be aware of both the implications, and what is required of the IDF to sustain such control. Publication of soldiers’ testimonies allows the public an opportunity to be exposed to such information, and to form opinions based on facts and realities from the field. The side we present is our side – the side of IDF soldiers sent by Israeli society to serve in the occupied territories. The incidents and experiences of which we speak are those in which we took part during our service. This is the reality we faced – and it’s the only one about which we can testify. Some testimonies recount cases of illegal actions by soldiers. Do you cooperate with the military police in investigating these cases? In our testimonies there are many cases that point to clear violations of military law. When these cases are exposed, the military judiciary system lays the blame squarely on the offending soldier, and misleads the public to believe that this individual is a ‘rotten apple.’ We know these aren’t isolated cases and that violations of military law characterizes the reality of occupation. Therefore we will not aid the system in shirking its responsibility through solely laying the blame on the individual soldier. Furthermore, most testimonies don’t address clear violations. On the contrary, they address the daily routine of the occupation (disrupting daily life, flying checkpoints, arrests, ‘straw widows,’ and more). The IDF cannot court martial soldiers for these acts, because that would lead to court martialing the entire system of military rule over a civilian population. Insofar as this is the case, we choose to present the public with testimonies so that Israelis may judge for themselves whether the deeds that constitute the occupation are compatible with the moral standards we wish to uphold in Israel. We are neither opposed to the initiation of investigations, nor to trying soldiers suspected of crimes. However, the matter most worthy of investigation is the systemic policy itself and decision makers’ responsibilities on both political and military echelons..
Regretfully, it seems that the military police invest the majority of their efforts in investigating low-ranking soldiers, thus effectively letting senior political and military officials off the hook, who are directly responsible for the policies carried out during military operations and the daily routine of occupation. Investigation of low-ranking soldiers allows Israel to present a semblance of objective investigation mechanisms before international investigative bodies. With regard to international law, this could prove to be an obstacle in launching external investigations of Israeli actions. Low-ranking soldiers are thus being used as ‘human shields’ by policymakers facing international demands for external investigations. You take one case, and make generalizations about the rest. ● On our website and in our various publications, thousands of testimonies can be found, from different areas, periods, and military units. Among these testimonies, one may find many varying incidents, each of which can lead to possible lessons and insights. Yet what all testimonies share is their description of Israeli military control over a civilian Palestinian population, namely, the reality of the occupation. ● Our understanding of the nature of the occupation is based on the thousands of testimonies we have collected and published to date, each of which adds another detail to the bigger picture portraying military activity in the occupied territories. If you do such thorough work, why were there reports that some of the testimonies were false? First, to our knowledge not one testimony has been proven false, to date. Incidents deemed false by certain reports such as the TV show HaMakor (“The Source”), relate to testimonies that were later subject to police or military inquiries that led to new, sometimes contradictory details, than those known to the testifier at the time (along with other soldiers and sources through whom we verified details). To provide the public with the most accurate representation of incidents described in published testimonies, we add notes for cases in which relevant information was disclosed following their publication. External sources sometimes find it challenging to authenticate our testimonies independently, as they may be unaware of testifiers’ personal details such as their unit, role in the incident, the precise period, etc. As always, our primary obligation is to the soldiers who chose to break the silence, and their decision to remain anonymous until they decide otherwise. Therefore, and in accordance with the Military Censor’s instructions, in some cases these details remain confidential, thus rendering these testimonies difficult to verify. We publish information as relayed by soldiers, in accordance with what they knew and were aware of at the time. We are committed to verifying facts described in the testimony itself, but do not presume to assume the role of an investigative authority collecting evidence for judicial proceedings. Accordingly, we do not conduct exhaustive, comprehensive investigations on all the events surrounding the incident described in a testimony, of which the testifier could not have known. The objective and end product of our work is the publication of the testimony, following the verification of the facts mentioned, in adherence to the exact words used by the testifier. Why do you speak abroad? We’re active abroad for the exact same reasons we’re active in Israel: to raise awareness and encourage discourse promoting the end of the occupation. To achieve that end, which is our primary objective, we’re happy to speak on any possible platform, anywhere. The occupation is not an internal Israeli matter. The occupation itself takes place outside the borders of the state of Israel, and is enforced over another nation, in a language that isn’t Hebrew. Many international factors are involved in the Israeli-Palestinian conflict. This is a universal issue of ongoing denial of human rights, and for that reason we consider each person and nation worldwide as responsible partners in this discourse. It’s important to remember that the occupation could not have lasted for 50 years without implicit or explicit enabling on behalf of the international community. As such, we hope to influence and encourage the international community too, so that it may contribute through creating conditions that will lead to the end of the occupation. Nevertheless, the vast majority of our work has always been carried out in Israel. Our testimonies, publications, meetings, tours, and lectures, take place first and foremost, in Israel and in Hebrew. Breaking the Silence’s activity abroad does not take place in a vacuum, but rather intends to challenge Israeli right-wing speakers who deem Israel and the occupation as indistinguishable. We wish to send a message to the world that supporting the occupation harms Israel, clarifying that support for Israel must entail ceasing to support the occupation. At Breaking the Silence we refuse to accept the right-wing and settlers as representatives of the Israeli public abroad. Not all Israeli citizens support the occupation and the settlements, and the international community must be made aware. During a period in which the international community is both exposed to and well aware of the current wave of anti-democratic measures furthered by the Israeli government, including legislation, and limiting the borders of legitimate discourse, we believe that making our voice heard is a valuable service to the image and standing of the State of Israel and its citizens. Neither in Israel nor abroad do we criticize Israeli soldiers (we are Israeli soldiers! ), but rather the policy that we were sent to enforce in the territories, which must be changed. We believe that all Israelis who oppose the occupation and aspire to end it, should be aware of the importance of sounding our voices in the international sphere. Who funds you? Why do you accept money from abroad? All our donations are received from private donors and different funds. We’re proud of all our donors, and practice full transparency of their identities from our very first report to date. The full list of Breaking the Silence’s donors is published on the organization’s website annually, as well as in every booklet and report we release. We yearn for the day when right-wing and settler groups will match our degree of transparency. Funding does not dictate our agenda, policies or goals, which are determined solely by Breaking the Silence. From the start, our main realm of action was, and is, collecting testimonies, without any relation to donors and donations. Like all other human rights organizations in Israel, Breaking the Silence does not receive any funding from the state. In contrast, many right-wing organizations enjoy generous government funding, at the expense of the Israeli taxpayer. These right-wing settler organizations, as well as right-wing government ministers, are heavily reliant on funds from foreign countries and donors. The funds that support Breaking the Silence originate from some of Israel’s closest allies such as the Netherlands, Denmark and Switzerland. These states invest hundreds of millions of euros in Israel’s scientific, technological, agricultural, and economic development. The right-wing tries to portray these states as Israel’s worst enemies, thus causing serious diplomatic and economic damage to Israel. The current debate in Israel on foreign funding of human rights organizations is nothing but an attempt to divert attention from the testimonies we publish, and the over five-decade long occupation. This is merely another effort to silence us by raising irrelevant issues. There is a legitimate debate on foreign funding, and whether Israeli organizations should be financed by funds from abroad. To seriously tackle the issue, one must apply the same criteria to all Israeli organizations that enjoy foreign funding – political parties, candidates, institutions, settlements, and organizations on both sides of the political map. Furthermore, Israeli civil society is supported by foreign funds in its entirety. One must understand that ceasing foreign funding for civil society organizations would destroy civil society – including numerous NGOs, and relief/aid agencies. Are you supported by or do you support the boycott movement (BDS)? Breaking the Silence has never supported the movement to boycott Israel, nor have we ever been supported by them. (Incidentally, BDS does not support or fund any Israeli organization). While we encourage, in principle, any non-violent action opposing the occupation, we regret that BDS – like the Israeli right-wing – does not distinguish between the occupation and the State of Israel. Similarly, it does not differentiate between the legitimacy of the State of Israel and the illegitimacy of the occupation. In contrast to some BDS supporters, we do not oppose the State of Israel, but rather the legitimacy of the policy of occupation. We believe that the legitimacy of the State of Israel must be preserved, and that the central factor undermining this legitimacy, in the eyes of the international community, is the ongoing occupation. This is why it is important for us to end the occupation through vital public debate on the moral price paid by Israeli society as it enforces military rule over a civilian population. Are you disturbed by the fact that your materials are used by anti-semitic organizations, and that your views are exploited to harm Israel, through calls for boycott, for instance? First of all, not all criticism of Israel’s policies is anti-Semitism, and there’s a big difference between the two. As activists attempting to change a political reality, we criticize Israeli policy and hope to find partners who share this point of view. As far as we’re concerned we only have two options: to speak or to remain silent. As silence comes at much too high a cost, we choose to speak. We are aware that our materials may be used for various means, some of which we may oppose. Yet we believe that this should not deter us, as it is a reasonable price to pay relative to the importance of our choice to break the silence. Many organizations invite us to speak, and we don’t necessarily agree with the views of each and every one of them (both right and left-wing). Yet, we have the responsibility to make our voices heard in relevant forums where they may make an impact. The mere fact that we speak in front of a certain audience does not imply that we agree with all its positions and opinions. Naturally, we are adamantly opposed to all forms of anti-semitism and racism, but anti-Semites and racists are not reliant on Breaking the Silence to fuel their hatred. What happened with the State Attorney's office? In February 2017, the State Attorney’s Office retracted its demand from the same year, to compel us to reveal the identities of testifiers who spoke about IDF policies carried out during Operation Protective Edge. It is important to note that the testifiers in question were all low-ranking soldiers accused of committing offenses that are not among the grave transgressions described in the testimonies we collected, nor among the severe violations that took place throughout ‘Protective Edge.’ To our knowledge, these are not cases in which Palestinians were physically injured or killed. ● Our obligation is first and foremost to the soldiers who choose to break the silence. Therefore, as long as it’s up to us, we will do everything in our power to keep their identities confidential. Our organization’s work depends on the willingness of soldiers to take a moral stand, assume responsibility, and provide testimonies, trusting our commitment to protect their identities for as long as they wish. It is this commitment that has enabled testifiers to muster the courage to break their silence over the years, leading to the publication of thousands of incidents that have been brought to the public’s attention. Forced exposure of testifiers’ identities would deal a severe and possibly fatal blow to the organization’s ability to continue gathering testimonies while ensuring the safety of silence breakers. This would entail an end to the flow of reliable information provided to the public by Breaking the Silence. This would mean that we would no longer hear the truth about events in the occupied territories from the soldiers themselves. It would imply that most – or all – of the information provided by soldiers would be filtered by the Military Spokesperson’s office or government agencies. This would deal a severe blow to freedom of expression, freedom of the press, and the public’s right to know about deeds carried out in its name. This senseless demand by the State Attorney’s Office was part of a political effort to damage the organization, following earlier attempts to thwart our activity. These attempts were led not only by settler organizations and other right-wing groups, but by the government, and the Prime Minister himself. It is hard to separate the State Attorney’s efforts from other attempts to silence and persecute us, including the destructive anti-democratic political wave washing over the Israeli government.. Forcefully revealing the identities of testifiers would send a threatening message to all soldiers, regarding the risks of breaking the silence. We were glad to see this attempt fail, as with the preceding efforts. We continue to believe in the importance of focusing on the big picture of Israel’s occupation policies rather than on any specific deed carried out by an individual soldier. Why do you speak of ‘Journalistic Immunity’?’ You aren’t even journalists. For years now, Breaking the Silence has carried out serious, in-depth journalistic investigations, in an effort to expose the public to the reality of the occupation and its injustices. We meet with ‘sources’ (testifiers) and receive detailed information (through in-depth interviews that last several hours). This information goes through a meticulous process of verification and cross-checking prior to being published. All materials slated for publication are submitted to the Military Censor’s office, and only following their approval are the testimonies published on our website and in various other publications, in an organized and systematic manner. One does not need to be a card-carrying journalist to enjoy journalistic immunity. According to criteria determined by Israeli court rulings, the work carried out by Breaking the Silence for over a decade, which includes the professional collection and publication of information for the public interest, is considered journalistic work. Accordingly, the principle of ‘journalistic immunity applies to the organization in safeguarding its sources. All those who have testified to Breaking the Silence did so out of a sense of responsibility and morality, to further the public cause of exposing the public to what goes on in the occupied territories. Testifiers rely on the organization’s commitment to upholding the confidentiality of their identities, for as long as they wish. Ensuring source confidentiality is a basic foundation of democracy and the free press, and is crucial for the public’s ability to be exposed to vital information that would otherwise be unobtainable. Should Breaking the Silence be unable to guarantee confidentiality to its testifiers, the testimony collection project will likely suffer a lethal blow. There is no other media organization (or any other type of group) that exposes and reports on daily life in the occupied territories from soldiers’ perspectives, in an accurate and thorough manner. Damaging the testimony collection project would mean dealing a severe blow to the public’s right to know about what is being done in its name. Furthermore, t could deal a grave blow to democracy and freedom of expression, signaling a victory for right-wing politicians who actively seek to silence us. Why do you collect classified information about the IDF? • Breaking the Silence does not collect classified information. 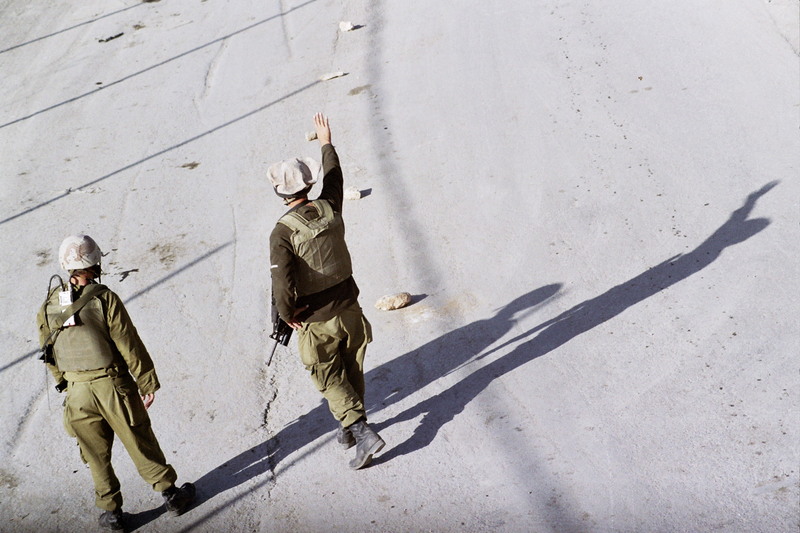 • For over 13 years we have interviewed numerous soldiers about their experiences in the occupied territories, hearing from them what military control over a civilian population looks like. We act both responsibly and professionally, consulting with senior legal sources upon interfacing with relevant figures in the military system. • All testimonies are approved by the Israeli Military Censor prior to publication, thus precluding any possible damage to national security. We have engaged in ongoing dialogue with the Military Censor since the establishment of Breaking the Silence, and we continue to do so to date. • National security and data protection are our top priorities. Accordingly, we operate with the requisite responsibility, to the apparent satisfaction of relevant bodies in the security services, who are well aware of both the type of information we address, and its scope. Have you ever published sensitive information? • No. We have never published, nor will we ever publish, any information that has the potential to compromise national security in any way. • Each and every Breaking the Silence publication is approved by the military censor, as required by law. We only publish material after it has gone through our meticulous verification process, and has received the Military Censor’s approval. • Throughout the course of our existence we have never breached any of the Military Censor’s directions, nor have we ever been approached by any relevant officials concerning our published materials. • The only individuals who have disseminated classified materials in the context of Breaking the Silence, were the Ad Kan moles, through their attempt to delegitimize and falsely incriminate us. Channel 10 journalist, Raviv Drucker, exposed that Ad Kan dispatched a mole named Roy Peled, who insisted on providing us with classified information. This attempt failed, of course. It is well worth noting that in their attempt to falsely incriminate Breaking the Silence, Ad Kan was willing to risk the release of classified information. Fortunately, this attempt was thwarted. What's the story with the moles? In 2016 several right-wing activists infiltrated our organization as part of an orchestrated well-funded incitement campaign against human rights and anti-occupation organizations, led by several pro-settler media outlets and organizations, with the full support of several government ministers. To date, we have exposed four moles from an organization called Ad Kan, thanks to our investigative and corroborative capabilities. Not one of the testimonies they provided was published. The moles we exposed – Amir Beit Arie, Haim Parmed, Roy Peled, and MK Oren Hazan – hoped we would publish their testimonies so that they could discredit our organization. Their attempts backfired miserably, further attesting to the degree of credibility and reliability with which we operate. Ad Kan is yet another organ of the extreme right-wing Samaria Settlers’ Committee, which notoriously supported and encouraged Jewish hate crimes, according to a Yedioth Ahronoth expose. The Samaria Settlers’ Committee were also behind Ad Kan’s campaign for the separation of Israelis and Palestinians on public transport. Ad Kan’s moles attempted to fabricate sexual harassment of Jewish women on buses by Palestinian men. The women were also revealed to be moles planted by Ad Kan. The fabricated harassments were presented on Channel 2 as if they actually occurred and happened to be caught on camera.